Hard Rock Café Pattaya has introduced a new live act to entertain nightlife attendees. The Cross Color Band is a gathering of 6 musicians with an international flavor coming from nations as far apart as the Philippines and Trinidad & Tobago. All of the band members have different musical qualifications, but one thing that is the same for all of them is an ability to entertain. Apart from singing, their dance routines are also fabulous and they can perform all types of music from blues to jive to hip hop. The Cross Color Band at Hard Rock Pattaya hotel. The band was officially introduced by Hard Rock Café manager Matthew Carlev at a special party held on Saturday, February 19 at the Hard Rock venue. The musicians took to the stage and received a warm reception from the patrons in attendance who happily danced the night away. 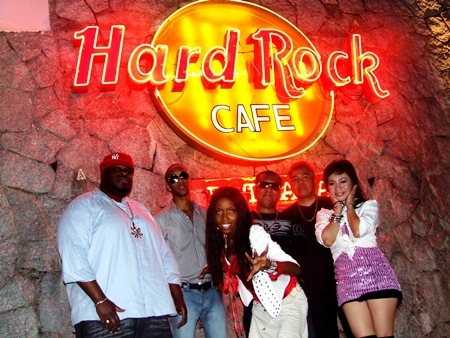 The Cross Color Band performs every evening at the Hard Rock Café on North Pattaya Beach Road from 9:00 p.m. –1:00 a.m.